This work has been compiled from the resources available online and is in no way definitive. It has sourced information and images available to you by those in the nursery industry so I ask you to please support those that grow the trees and sell them. There is also several well written books on this subject which I haven’t referenced as I haven’t included their information but use it myself to make the judgement that blended ciders generally make a better product. The varieties shown are ones I am aware are available through our heritage fruit network grafting days and so should be available to you. Yalca lists this variety as “The Antoinette cider apple is a rare French cider variety, makes a bittersweet cider”, my research concludes that it produces a very complex cider on it’s own with subtle flavours. Quite a famous type of French cider apple. Discovered in Massachusetts, USA, 1740. Medium to large, yellow base flushed with orange and striped red. Juicy with sweet to sub-acid flavor, aromatic and firm. Good cider base. Usually a productive and vigorous tree. Often a biennial bearer. Triploid. This is a sweet apple with low acid, can be used for eating as well, not much information on cider usage, my guess is it would be better blended as it has low acids but high flavour. It is a late apple. This is a massive French apple, used for eating and cooking as well as cider. Flattish with green skin striped red on sunny side. It is another probably best added to a blended cider. Generally a great cooking variety, in fact the go to apple in England. It is used for it’s sharp taste and tannin level in cider blends. It is a triploid so pollination needs to be taken into account. 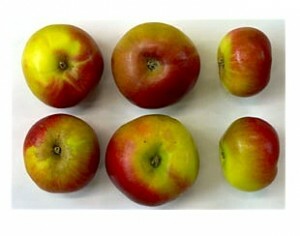 Originating in Wales, Breakwell’s Seedling cider apple produces handsome striped red coloured cider apples, very good fruit load, also self fertile so it sets good crops without pollination, makes a bitter-sharp cider type. Originated in Devon. It was discovered by Mr Hill, a cider maker and nurseryman of Staverton, near Totnes, Devon. Known to have been in existence in the early 1920s. Trees are very vigourous and can therefore delay cropping. Fruits are medium sized with white flesh which often carries a red tinge especially in highly coloured fruits. Produces a medium-sharp, fruity but rather thin cider. Also somewhat resistant to apple scab. Probably suggest using this as a blending apple to add sharp notes whilst the others ensure the cider has body. 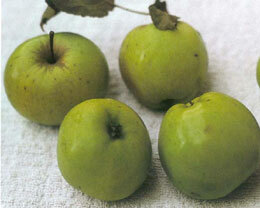 Coming out of France in the 1800’s, Bulmer’s Norman cider apple, the fruit are fairly large, with light green skin, and soft flesh, harvests midseason, makes a bittersweet cider, good quantities of juice per kilo of fruit. My research indicates it is not a great stand alone variety as it doesn’t have the sharp taste etc. to develop great character alone. As a blender it enhances the final product as it holds great tannin levels. 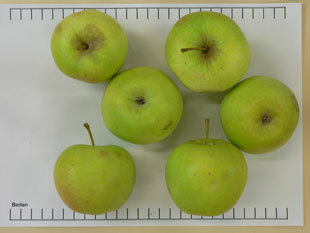 It is a very poor pollinator of other apples as it’s a triploid. Apart from being a famous culinary apple, it's well known for making excellent cider. Sharp. Dating back to the 1600's in Normandy, France. Under an irregular yellowish russeted skin, it has an appealing aromatic flesh. Tip-bearing. This is a variety for those with some room as it is a triploid and therefore needs several pollinators. 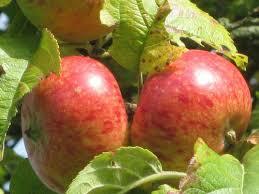 Generally a cooking apple (used in France to make tarte aux pommes) it does however have very strong aroma. it's well known for making excellent cider. Sharp. Dating back to the 1600's in Normandy, France. Very old variety, originated from Normandy, France. It was known in 1200. Fruits have firm, white flesh with a fairly sweet, subacid flavour. 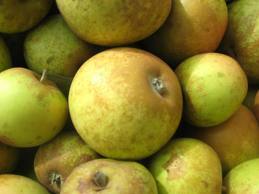 A rare French cider variety, Closette cider apple has a mostly green skin, with some red blush, medium sized fruit makes a bittersweet cider, ripens late, this cider variety can also be eaten fresh. Old variety known since 1613, probable origins in Roman times. The name is derived from Corps Pendu, referring to the shortness of the stem. Skin is greenish-yellow becoming flushed with orange-red with short broken stripes. A good cropper with rich, aromatic fruit with a good balance of sugar and acid. Suitable for areas with late spring frost because it blooms very late and is cold hardy. This cider variety produces a light, sweet, vintage quality cider. The fruit are large and the tree is known for its vigorous growth and good cropping tendencies. Court Royal was found in East Devon. A very high quality English cider variety, provides a bittersweet juice for cider making. Antique French cider variety, Dabinett cider apple produces fruit that are fairly large, with bright red skin, and soft flesh, harvests midseason. Considered a very good single variety cider choice. It is also self fertile. Possibly ideal for those wanting only one tree to make cider from. The name translates as Sweet-Bitter-Grey, the tree is vigorous and the fruit quite large with a sweet sub-acid flavour and little bitterness. 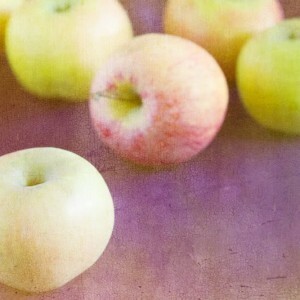 The apple is a good all-rounder for cooking, juice, hard cider and straight eating. 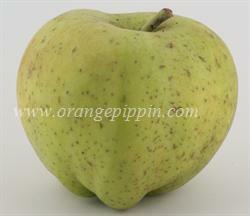 An old apple first recorded in 1608 when described as Espice D’Hiver, listed by Olivier de Serre. It was in the London Horticultural Society catalogue of 1826. There has been some confusion between this and Caraway Russet, starting with Lindley in the 1830s, and not entirely resolved. The word Fenouillet means fennel, of which the apple’s flavour is said to be reminiscent. 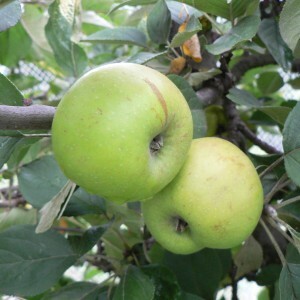 It is a dessert apple but has also been used for cider. Scott in 1872 describes it as medium sized, in season February to March, roundish ovate, but broadest at the base. The skin is golden yellow nearly covered with brown russet, with a greyish brown tinge on the sunny side. The flesh is yellowish, rich, tender, crisp and sugary with a fine aromatic flavour. It can go woolly if kept too long. The tree is a slender grower, but good bearer in warm soils. Dusky red skin, flesh is considered bitter sharp. Strictly for cider. This may be a variety suitable for single use if the cider is stored for a lengthy period. Thought to have originated in France. It was brought to England at the end of the 1700s. Fruits have white, distinctly green tinged flesh which is very firm, coarse-textured and a little juicy and acid. It cooks well, having a strong aroma when cooking. We deem this a cider apple, the English use it mainly for cooking. I believe it may be good as an addition to a blended cider as it would add aroma and some acid to the mix. As an aside, Granny smith is thought to have come from this apple. Frequin Tardive de Sartre cider apple is another of the French types of cider apple makes a very sweet cider on its own, greenish yellow skinned, not much blush, fruit are also able to be eaten fresh, ripens early to mid season. 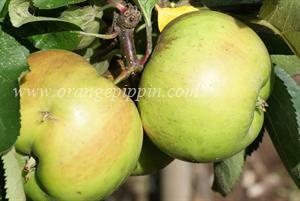 Golden Harvey cider apple also known as ‘Brandy Apple’, thought to have originated in the 1600s in Herefordshire. Fruits have firm, crisp, sweet, aromatic yellow flesh, this apple eats well fresh, as well as being a handy addition to cider brews, makes a sweet cider. In England this variety is known to produce strong cider. This crabapple is used for cider for several reasons. Firstly it has a high bitter sharp flavor and produces fruit abundantly. Secondly for its ability to pollinate many varieties of apples in the orchard and lastly for its disease resistance including fire blight. Considered by many to be one of the best all round apples in the world. Said to have originated either in the garden of the Duke of Augustenberg, Castle of Graefenstein, Schleswig-Holstein or in Italy or Southern Tyrol and sent to Schleswig-Holstein, or scions from Italy sent home by a brother of Count Chr. Ahlefeldt of Graasten Castle, South Jutland. It is thought to have arrived in Denmark in about 1669. Fruits have crisp, rather coarse-textured, juicy flesh with a pleasant mixture of sweetness and acidity with a distinctive flavour. A TRIPLOID variety which requires a pollinator, but has no viable pollen. This is not generally used for cider but can be used as a part of a blend to add a sweetness for fermentation and acidity to add complexity. It would only be a minor component I believe. This is an excellent eating apple. Not normally used for cider historically, but it’s rich aromatic spicy flavour would further add to a blended ciders complexity. 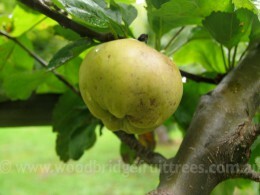 An old Somerset apple known since at least 1819. It takes its name from the hoary appearance of the skin, like that of a peach. 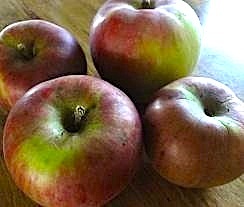 Medium to large apples, with a greenish-yellow skin, prominently striped with deep red and with sweet, rich flesh which may be used for cooking or for dessert. Keeps until spring. Good crops. This apple like Grimes Golden is an excellent eating apple. It can be added to a cider blend due to it’s complex flavour profile, but like Grimes, it would be added to a blend in moderation. Skin deep striped crimson and yellow, flesh yellow with a red tinge, tender, and with a rough acid flavour, the Improved Foxwhelp cider apple is one of the most valuable of the cider apples, makes an extremely sharp cider, useful for blending with juices needing a bit of kick, from Bulmers, Hereford, England, prior to 1920. This could do with a sweet type and a tannic type for a rounded cider. Bittersweet, small round yellow green with russett, flowers and ripens mid-season, high sugar and tannin. Can be a biennial bearer so thinning the fruit may help. King David cider apple is a handsome southern American apple, originating in Arkansas, the flushed orange skin, reminscent of Jonathan, one of its probable parents, becomes much darker as the season progresses, till it becomes a brilliant dark red colour, the apples hang on the tree almost to winter, deep into autumn, and are at their best for eating at this point, also a useful cider variety with some good kick to it. Quite a spicy / tart apple, similar to a winesap. Once again I would probably suggest this be a part of a blend. Kingston Black cider apple is a cider apple with very pretty skin colouring – crimson and streaked darker crimson on yellow background, flesh yellowish and tender, with only a mild acidity, makes a bittersharp cider. Also known as Black Taunton, the Kingston Black cider apple was a popular cider apple in Somersetshire, and is perhaps the most well known of all cider apples available today in Australia. This variety was introduced into Herefordshire c.1820 by Mr Palmer of Bollitree Estate, Weston-under-Penyard near Ross-on-Wye. It is partially self pollinating as well. It is however somewhat prone to disease. Bittersweet, Large round to conical, yellow washed with pink and touches of russett, flowers early ripens mid season, flesh sweet to Bittersweet. Also known as Somerset Pomeroy, Pomeroy. First described in 1851, but undoubtedly much older. An attractive late dessert apple, the skin flushed deep scarlet. Sweet, crisp, juicy flesh with a pineapple flavour. Reine De Hatives cider apple is a sweet French type, raised in 1872 by a nurseryman in Normandy, small pale yellow fruits, produces a soft neutral sweet cider, good cropper harvests early. Probably best as a blending variety. 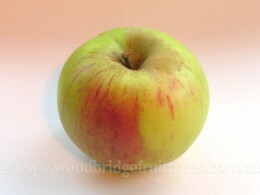 This is an American sweet eating apple also used for cider in the states the taste is described as having some tartness. It is like all russets a fundamentally sweet apple, also a fairly good keeper, an important attribute before the advent of modern storage methods. Visually the extent of russeting can vary considerably, in some seasons and on some trees it can be extensive, whilst in other situations there may be very little. 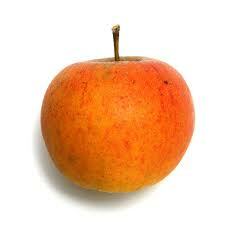 This is one apple best used in blending as a smaller component so your cider has more character. Thought to have originated in the Sutton Montis area of Somerset. 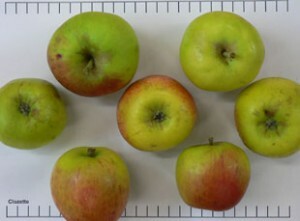 As a result of its good performance in a 1917 trial at the National Fruit & Cider Institute together with good orchard performance at Burghill, Hereford, it was subsequently propagated to be included in many commercial cider orchards. The medium sized fruit ripens in October. It produces a mild or medium bittersweet cider of average quality. This means it should have gentle tannins with little acidity and a fruity taste, producing light and fruity cider. Once again I would suggest to aim for the fruity character here with some of the tannins and add a more tannic apple to the mix to increase storage life and sweet types to increase the strength. Stoke Red cider apple is a classic cider apple from Somerset in England, it became well known around the 1920′s, smallish fruits which produce a high quality bittersharp cider, often with a good aroma to it, this variety was once known as ‘Neverblight’ due to its robust resistance to disease, well worth growing. This is a good variety to use for a single varietal cider. 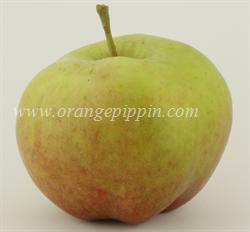 Usually seen as an eating apple, the Sturmer Pippin apple is very sharp when first picked then becomes very sweet when stored for a period of time. It is often divide pressed early on for ¾ of the harvest amount to get a sharp juice and the other ¼ pressed later when sweeter and the two fermented juices blended to make a better quality cider. An early ripening apple from Russia that was first recorded in 1831. It has scored well in tastings and with a high acid content is good for cooking. Can be used for cider. Variety from Devon producing a good quality sweet cider, sometimes mildly bittersweet. An old variety originating in Devon. Once very common in cider orchards in the Exeter area. Susceptible to mildew in damp climates. Tends to biennial cropping. Produces a pure sweet, sometimes a very mild bittersweet cider of good quality. This variety is also self pollinating. Originating Devon, England, Tremlett’s Bitter cider apple, small to medium fruit, flushed and striped red, starts bearing very early in its life, self fertile, mid to late harvest, makes bittersweet cider. Verite cider apple grown in France, small, dark red and flushed, intense and brisk flavour with some sharpness, good for juice and fresh eating, also for cider brews Probably suggest this is better as part of a blend for better flavor profiles. Originating in the village of Yarlington, Somerset. It can be a strong biennial cropper unless pruned regularly. Yarlington Mill cider apple bears smallish fruit, yellow skinned, starts cropping very early in its life, is self fertile, and described as being “possibly the doyenne of cider apples”, harvest midseason, the tree was originally found growing out of a wall next to the wheel of an old English mill, and soon rose to prominence due to its heavy cropping. If you are going to grow only one type to make cider this is it. A US variety raised in 1813 and selected by Matthew Yates of Fayette County, Georgia around 1844. It keeps well and its small size and sweet flavour make it an excellent choice for school lunch boxes. Used for cider production in USA. Normally an eating apple so I would recommend this as only a part of the blended cider group you choose.